2012 Year in review- Street Church exploits! What a year it was. We had great victories and huge challenges. 2012 was a year where God was testing and shaping us. It felt like He was watching to see if we would persevere and be faithful with what He had commanded us to do. God really challenged all of us this year by searching our hearts to see who would endure through the trials and tribulations. If I could sum up the past year I would have to say that it was one of the best years and also one of the hardest. What saddens me is that there were people who had seen the signs, wonders and miracles, the work of the Almighty God, and chose not to go all the way. To posses the promise land you must go all the way. You cannot simply say: God this is too difficult and those giants are too big. In life, we will always be faced with hardship. It is God’s way of testing our faith. Remember what happened with those who rebelled against God’s plan in the wilderness. As believers in Christ, we have to understand that we are accountable to God for our yes and our no. Do you think God will find his people guiltless if they will not stay true to their word for whatever reason? I don’t think so. You can’t change camp in the middle of a battle without being found guilty. God expects us to be faithful to Him and also to those with whom we are to work in His Kingdom. There is never a great victory without great challenges. I always say the bigger the Goliath, the louder the sound when he falls. We lost wonderful people this past year, but God has already replaced them with others who want to go all the way. God is looking for people who are dedicated, faithful, willing and after His heart. Let me remind you that God’s heart is always for souls. When you look back, it is hard to believe that such a small group of people were able to accomplish such great exploits for God. It is because these people are doers not just talkers. God’s power and His will were manifested in this ministry. Thank you to everyone who contributed to all of those victories. May God bless you greatly. Over the winter months, we as a church were blessed to have church services in the heart of the city. Every Tuesday we met at lunch time in the front lobby of City Hall. What a time we had. The building was filled with worship, preaching and prayer. There is no better place for prayer and worship than in the heart of the city. We were invited to Parliament in our nation’s capital. The time was filled with many great meetings and prayers. We spent time with some Members of Parliament and we received a tour. What a great opportunity it was to impact our elected officials for the Kingdom of God. Street Church was attacked by a terrorist group called “Anonymous.” The group demanded that Street Church cease defending its rights in the public square. It is interesting to note that Street Church was attacked just a few days after Israel was attack by the same group. The story presented in pictures continues. Lets us note here that our comics are the number one hit on our website. We have distributed thousands of printed copies on the streets of Calgary. Street Church was invited to the opening of the Peace Bridge here in Calgary. We were asked to set up a promotional tent for this event. Our highly popular booth attracted thousands of kids and parents alike. We closed the day off by blessing the bridge with singing and claiming the territory in Jesus’ name. What an amazing thing it was to raise the name of Jesus. Artur Pawlowski was named Honorary Chaplain for the province of Alberta by the organization called The Magen David Adom (Hebrew: מגן דוד אדום‎, abbr. MDA or Mada). Since June 2006, Magen David Adom has been officially recognized by the International Committee of the Red Cross (ICRC) as the national aid society for the state of Israel under the Geneva Conventions. It is also a member of the International Federation of Red Cross and Red Crescent Societies. Street Church and Art Pawlowski were awarded this Honorary Chaplain position due to their continuous support of Israel. 2012 marks the first March for Jesus in Poland after 20 years. Right in the heart of the capital city of Warsaw through the Royal Route, thousands of people lifted the name of Jesus Christ .With prayers and dancing, we were able to impact countless lives (there were about 100 000 people in that area). After the March, there were concerts and testimonies. Everyone could feel that it was just the beginning of a great awaking that will grow out of the middle of Europe. Praise God! Artur Pawlowski received the ‘Free Speech Award’ for his 7 years of ongoing defence of Canadian constitutional rights and freedoms. During those seven years, the pastor has been arrested nine times and has stood over 70 times before civil, criminal and provincial courts for his ‘crimes’ of defending the rights of citizens in the public square and for assisting thousands of less fortunate people in Canadian society. This award came from the organization called The Progressive Group for Independent Business (PGIB). It is worth mentioning that Canada’s Prime Minister Stephen Harper also belongs to this organization. The pastor was presented with the award in front of people from the business community, Canadian veterans, and politicians such as Jonathan Denis (Minister of Justice and Solicitor General), Ric McIver (Minister of Transportation) and some city aldermen. As we speak right now, we are facing three major trials. Two of them are for our “illegal public prayers.” Please pray for us to receive God’s favour and His wisdom, and that the wickedness and lies of city hall will be exposed. Poland is on the verge of a great revival that you can feel everywhere. People are becoming more excited about sharing the gospel. Street Church in Warsaw is reaching thousands of people every week. In the heart of the capitol city, theirs is a light so bright that countless times they have been featured in national magazines, newspapers and TV documentaries. God is increasing their influence and blessing them for their faithfulness. Last year, we also started another Street Church in the city called Szczecin, and we are pleased to announce that they are holding the post and growing in strength. On July 1, 2012, Canada Day, and we had a great opportunity to set up a church in the middle of Calgary’s Prince’s Island Park and proclaim to the public what we believe in. We did just that! A number of volunteers equipped with a tent, flags, thousands of tracts, bibles, drinks and snacks set up a visible ‘light’ on a hill for all to see. You have to understand that there are hundreds of thousands of people who take part in the Canada Day celebrations. In this park alone, there were over 100,000 people which meant a lot of work for us :-). During the 12 hours (from 11 am to 11 pm) that we were in the park, we gave out an astonishing amount of food and drinks (at least $15,000 worth) all for the glory of Jesus Christ our Lord. The March for Jesus 2012 was officially opened by the Minister of Transportation Ric McIver. The Minister along with his wife, Christine, came to bless this celebration. He said: “I am honoured to be here with everybody to celebrate our Christian faith on the streets of this city, and we are proud of it…We are going to have fun and I’m proud to be here with all of you.” Remember to keep this family in your prayers. We need more officials who are not ashamed to celebrate their faith in the Creator of the heavens and the earth, Jesus Christ. This year was very special. For some time now, we have had our hearts set on introducing more spontaneous dancing to our street celebration. We believe that God lives in the praises of His people and He simply delights when we all feel like dancing. After all, we are saved and alive because of our mighty God. We have a lot of things to celebrate, and so we did just that. We also received an official letter from the Alberta Minister of Justice and Solicitor General commending us for putting on the March for Jesus 2012. This is a minister who is reminding everyone that no matter what position we are in, we are not to forget to confess our God and Saviour, Jesus Christ, before men. Please pray for those in power that they would bow their knees before Jesus and rule the city, province and country with the truth and righteousness of God. We had an awesome time at the Prime Minister’s barbeque. My wife, Marzena, and I went to the Prime Minister’s barbeque with Bogdan Stobiecki and my brother Dawid Pawlowski. Every time we meet with different politicians, God always gives us opportunities to sow the seeds of righteousness into their lives, but this time it was exceptional. We had conversations with different politicians like Jason Kenney Minister of Citizenship, Immigration and Multiculturalism; Rick McIver Transportation Minister for Alberta, and many more. Truly as ambassadors of the King of kings and Lord of lords God places us in a position to bring light and salt to represent His kingdom’s righteousness. I had a great talk with Stephen Harper and was able to tell him about our troubles with the city aldermen. I spoke of how these politicians constantly implement unconstitutional laws despite a number of court rulings that the laws have “no force and effect.” I shared with our PM our stance on defending our rights and freedoms. Street Church leads the Calgary Stampede Centennial Parade! It was a great privilege and honour to open the Calgary Stampede’s Centennial Parade! In this memorable year of 2012, the name of Jesus was the first entry in the parade. May this be just the beginning of a great awakening, a revival if you will, in the city of Calgary and in the country of Canada that we call our home. For the 100th year anniversary, God reminded everyone that the name of Jesus Christ is truly the Name above every other name. For our entry, we all came dressed as 15th century knights and maidens. We even had the boys as young knights and the girls as princesses. We brought banners that said ‘Jesus is King’, ‘Jesus is coming back’, ‘Repent! Turn to Jesus’ and others. On five big shields were the letters J E S U S, which led the way as the rock of our salvation. Lydia carried a big Bible as a reminder to all of us that the Word of God is the foundation of our faith. For the first time in the six years of participating in Calgary’s Stampede Parade, we had the Israeli flag, which was carried by our Jewish brother Brian. We did this because according to the Scripture God says: ‘I will bless those who bless you…’ Many times we have felt like Israel, outnumbered, surrounded by vicious, ungodly enemies and standing against all odds proving again and again that our God is THE God of the impossible. When He is for us, then none can stand against us. Street Church and Artur Pawlowski are featured in upcoming international documentary film. The amazing story of hope and perseverance in the face of trials, opposition and arrests captured the attention of renowned overseas movie director Tomasz Wiszniewski. Director Wiszniewski and his crew spent almost two weeks in Calgary filming the daily activities of Street Church and their volunteers. During the two weeks, the filmmakers witnessed and recorded firsthand what motivates and empowers the volunteers to stand for truth and in defence of human rights. They witnessed many lives being impacted during their time in Calgary through prayer, salvations, and the meeting of basic needs such as food. This production was filmed at various locations such as Lake Louise, Drumheller, Calgary, Hobbema and Warsaw, Poland. The film was shot by cameraman Alex Pavlović and it is produced by Henryk Dedo. City Hall once again proved to be vicious and anti-Christian. They show no heart or compassion for the poor, nor respect for our Canadian values and freedoms. In September of 2012, they passed another unconstitutional law in an attempt to shut down Street Church. For feeding the poor and preaching the gospel, Street Church volunteers can now receive a fine of up to10 000 dollars or up to 6 months of jail time. Imagine your new Canada. Please pray for God’s law and righteousness to prevail. For participating in the Calgary Stampede Parade, every volunteer is facing 10 000 dollars worth of fines. For this terrible crime, Street Church is presently facing one of the biggest trials ever in Street Church history. It is estimated that the trial will take over 30 days. Wow! What a wonderful time we had during New Years Eve! Street Church volunteers finished off the year with the Gospel of Jesus Christ and started a new one with the love of God. At 6pm a truck loaded with food, pastries, gospel tracks, videos and bibles went out to the streets to celebrate New Year’s Eve with the poor. To our delight Olympic Plaza, where we had decided to set up for our celebration, was crowded with thousands of people who had come to welcome in the year 2013. We fed hundreds of people nonstop from 6pm to about 12:30am. Not only the homeless but many others also came to receive blessings from the Lords table. Praise Jesus! What an opportunity to show God’s tangible love. By the end of the night, we were able to preach and share Jesus with thousands of people. These are just a few stories of the awesome things that we were privileged to be a part of in forwarding the Kingdom of our Living God. If God Himself was not with us, then all of the things that we were able to accomplish would not have been possible. To Jesus Christ all of the Glory, Honour and Praise! Thank you Jesus for 2012! Alberta’s new Transportation Minister Rick McIver is going to officially open the March for Jesus 2012! 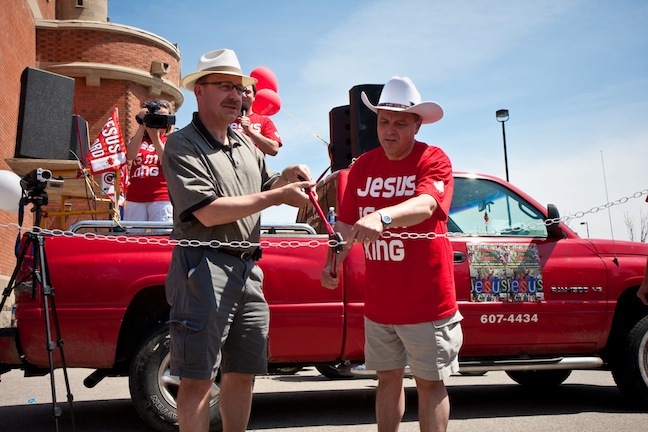 June 13, 2012 Artur Pawlowski Comments Off on Alberta’s new Transportation Minister Rick McIver is going to officially open the March for Jesus 2012!